Step Up SA wants you to say thank you and give something back. Is there someone in your life who helped or inspired you to become the person you are today? And did you ever have the chance to thank that special teacher or mentor? 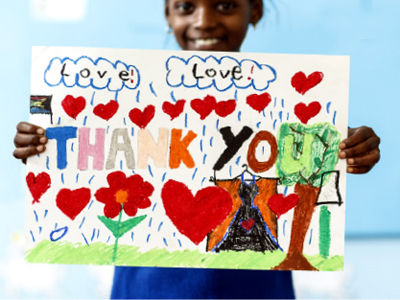 That’s what Step Up SA wants you to do – say thank you and give something back. Step Up SA is an initiative of Community Keepers, a nonprofit organisation that does upliftment work in and around Stellenbosch. “Step Up SA not only makes it possible for people to thank those who’ve made a difference in their lives, they can also plough something back into the community,” says Philip Geldenhuys. Anyone can support the project by buying a digital card and sending it to someone who made a difference in their lives. The proceeds are used to fund Community Keepers’ school projects. Go to the Community Keepers website. Choose the virtual children’s art you want to send someone. Type in your name, the name of the person to whom you want to send the card and a personal thank-you message.